The journey to creating Pure Integrity started with the black soot regular candles were leaving around our house. We started looking into what was in these candles we were burning. What we learned was shocking. Paraffin wax, which is what most candles are made of, is a petroleum by-product made when refining oil into gasoline. All told, a regular candle typically includes at least 11 toxins from the wax alone, two of which are known carcinogens, plus neurotoxins and reproductive toxins from metal wicks and synthetic fragrances. We didn’t want our family breathing in these toxins, and we were sure plenty of other people didn’t, either. So we started Pure Integrity. Using only natural soy wax, cotton wicks and healthier fragrances, we hand pour the best scented candles on the market today! 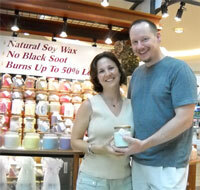 You can feel confident burning Pure Integrity candles in your home – the safe, strong, healthier choice for your family! Using the Innovative Fragrance Technology we designed ourselves, plus our 7-step pouring process, we hand-pour the most fragrant soy candles in the industry! Our candles smell great from the first light to the last – a great value for you and a wonderful scent experience for your whole family.